Sign up as a Hitch Driver now! You get access to exclusive deals with our partners, like the 4 insurers onboard the HitchShield Panel. Hitch Drivers get $50 in their Driver wallets when they renew their motor insurance policies with either Income, ETIQA, MSIG or Sompo. Signing up only takes 5 minutes and you can do it straight from your mobile phone! Simply open the Grab App and follow the steps below. 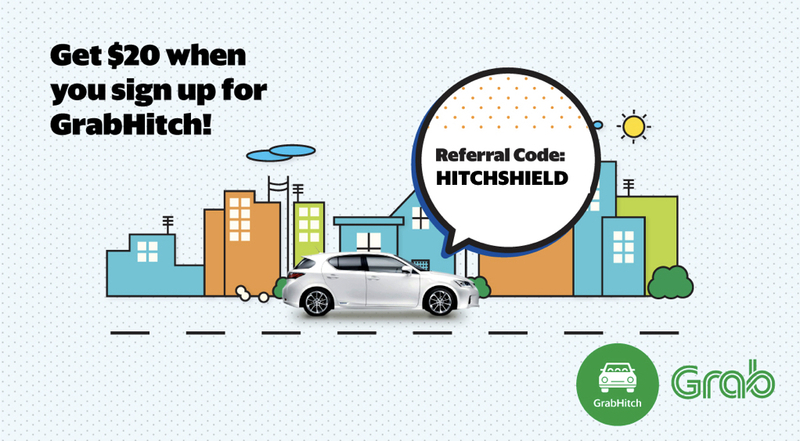 Get $20 credit in your driver wallet when you sign up and complete your first GrabHitch ride with referral code HITCHSHIELD by 31 March! *Your application will be approved in 1-3 business days. This incentive is only eligible for new drivers who sign up and successfully complete 1 Hitch ride as a driver by 31st March 2018. New drivers must sign up with the referral code HITCHSHIELD in order to qualify for the $20 credit. The processing of the $20 credit will only be conducted after the incentive period has ended (i.e. post 31st March 2018). Have questions? Email us at support.sg@grab.com with subject “HitchShield” and we will get back to you in 2-3 business days.